This LFW, a lot of designers have chosen to forgo jewellery altogether (boo, hiss). Designers as different as Anya Hindmarch, Huishn Zhang, Chalayan, and Richard Malone had one thing in common: they kept the focus on the clothes with their stripped-back looks. A few designers have decided to buck the earrings-or-nothing trend with some serious statement necklaces. Topshop and Christopher Kane went with statement chokers, Roland Mouret with huge bone pendants, and Holly Fulton with bright, 70s-inspired beads. The whole collection looks like a 30s socialite would wear it on the French Riviera and I bloody love it. It’s full of embroidery, sequins, and tulle, three of my absolute faves. And, yes, this pick is may partly be because one of the dresses looks a loooot like my wedding dress! That’s all on Fashion Week. Join me next week for a nostalgic one: the first in my new series exploring the jewellery in Disney films. 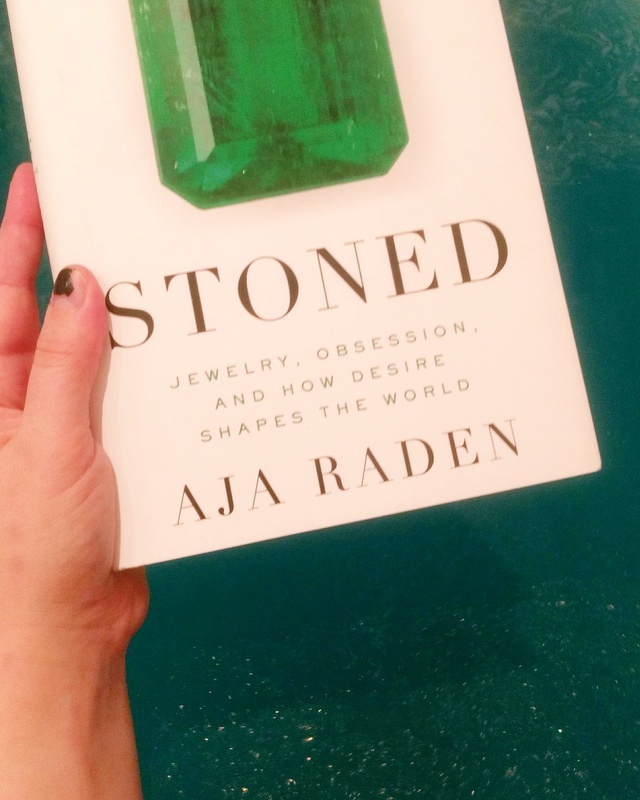 Anyone who follows me on Instagram might have noticed me posting a few pictures of Aja Raden’s ridiculously photogenic book, Stoned, over the past month. It’s taken me a bit longer and got me a few more weird looks on the train than I expected (without the dust jacket it just looks like a book about weed), but I loved it. First things first, I really loved the format of the book; you can’t really go wrong with chapters focused on one object/story that fits into the wider theme. I just feel like it’s such a strong way to zoom in and out on a topic. It’s hard to pick out one of the chapters as the best, but the one on emeralds was a winning combination of medieval exploration, science and witty anecdotes. It was also probably the most interesting for me personally in terms of new knowledgefor example, did you know that emeralds are formed by the crashing together of continental plates?! Another thing I seriously enjoyed was the amount of fun Raden had with the footnotes (special shout out to the giggly footnote on page 36 about ballsacks). It reminded me a bit of one of my all-time faves, The Princess Bride. Stoned was also scattered with puns, which I obviously adore. The only downside to the irreverent tone was that it sometimes strayed into sounding a little forced, but the multiple times I laughed aloud more than outweighed that. 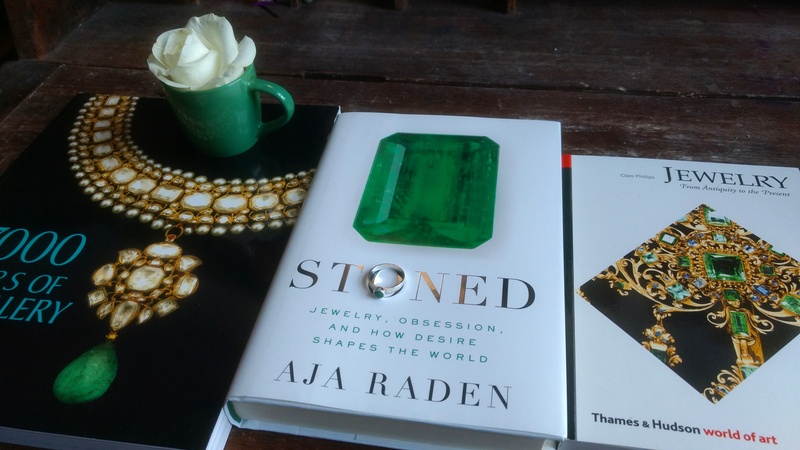 Stoned was a really interesting blend of science, geopolitics, history and art, probably because Raden has a degree in Physics and Ancient History and is a jeweller herself. Obviously I read it because it was about jewellery, but I think it’s one of those books where you can pick out your interests and follow the threads throughout. I particularly enjoyed the historical commentary and healthy dose of gender politics (although I’d argue that the description of Catherine Howard as ‘empty-headed’, ‘moronic’ and a ‘young tart’ was a bit jarring and harsh, as well as an oversimplification of the historic context in which her marriage took place). Overall, I thought Stoned was a fab balance of detail and broad pictures, and Raden had obviously done a ton of research. Her knowledge of jewellery design also made for some really fascinating descriptions and explanations of key pieces. I’d definitely recommend it, particularly to anyone who, like me, is busy and therefore has unpredictable amounts of time to read, because it’s pretty easy to dip in and out of without losing interest or focus. Favourite quote: Hands down the point where Isabella and Ferdinand of Spain were described as ‘putting the ick in Catholic’ with their religious intolerance, although a close second was the description of ‘the United States spreading across the North American continent like a bloodstain’ during the 19th century. Favourite new fact: Engagement rings for both men and women were made mandatory for Catholics by Pope Innocent III in 1215 (mostly because of all the crusade-based shagging that was occurring), so fiancé and I aren’t being the hipster arseholes we thought we were, but are in fact being medievally Catholic…huh. Amidst all the furore about the clothes, jewellery design can sometimes get forgotten in the main news coverage of Fashion Week, so I’ve compiled my favourite jewellery collections from London, Milan and Paris, and found a few handmade Etsy versions as well. Old meets new with crystal ear cuffs and vintage-style brooches and cameos alongside tweed, checks and embroidery. Love, love, love this aesthetic, and it’s actually achievable off the catwalk, too: grab a patterned shirt and cardie and you’re good to go. Stand-out piece: that gorgeous be-ringed hand pendant. Edit: The first new design has dropped. Check it out here.